The Spanish have figured breakfast (and possibly dessert) out. Who doesn’t love deep fried sugared dough dunked in rich, dark cocoa? Robby and I just returned from Spain and enjoyed an excuse for a morning sugar high with this classic combo. 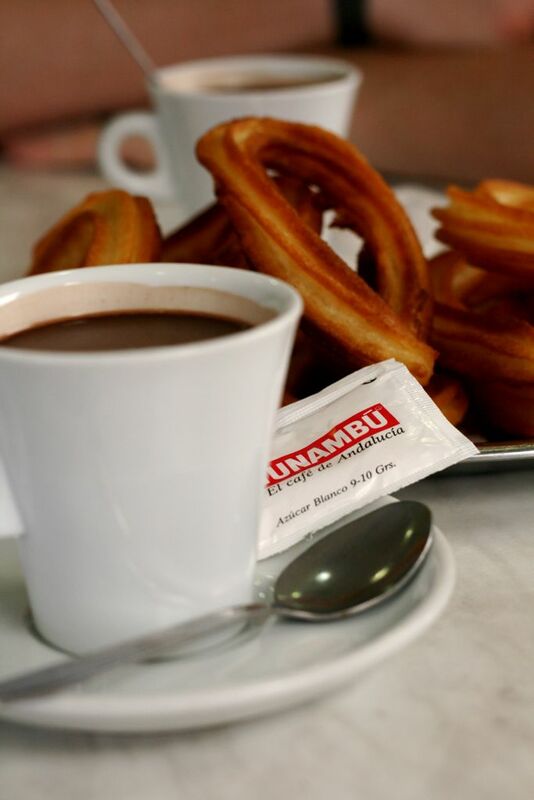 We sat in a run-of-the mill Spanish diner sometime around 10:30 am and thanks to Robby’s spanish he rattled off that we would like an order of churros y chocolate as if we were locals ordering this every Saturday morning. The churros came bare and piping hot. It didn’t take long for me to tear open the sugar packets and sprinkle the sugar over the fried pastry as if it were snowing. 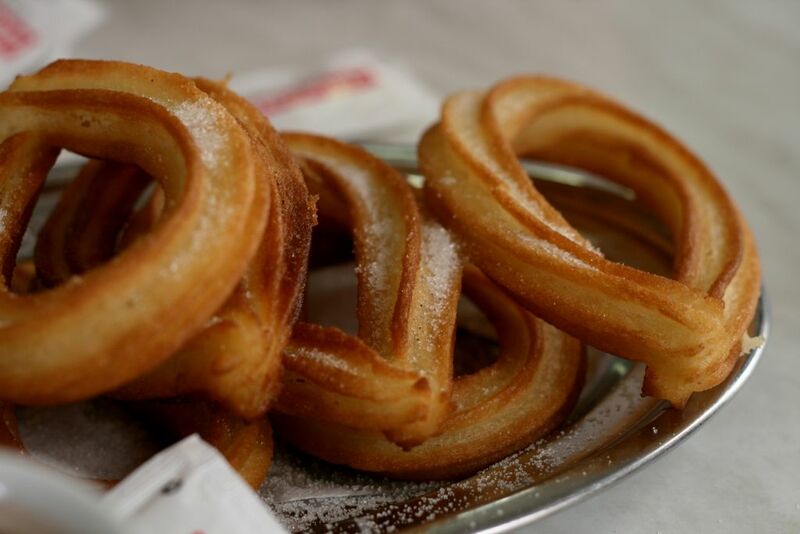 Plenty of sugar soaked right into the golden brown pastry with the perfect amount of sugar dusting left on the tops of the churros and the bottom of the plate. The chocolate was SO rich (in a very good way). This may even have made the list for my Top 10 indulgent food memories. Each piping hot stick of fried dough dunked in the decadent chocolate felt like a sin. 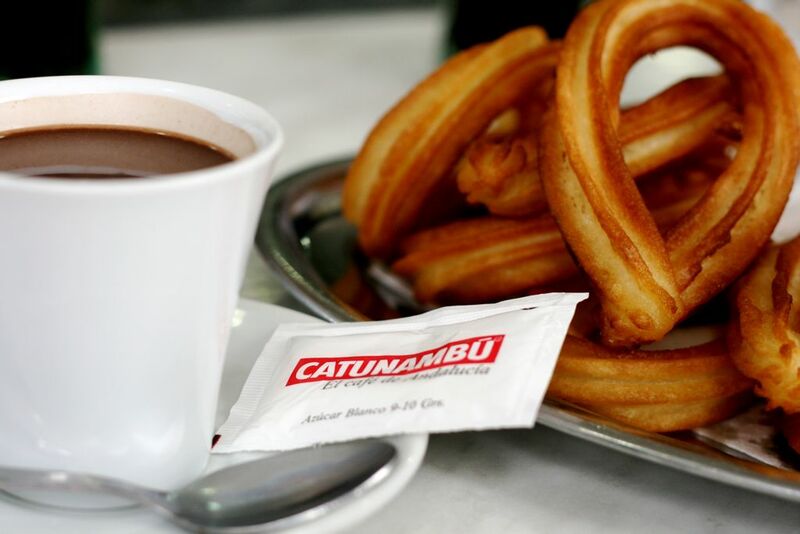 It was as if the churros were just acting merely as a vehicle to transport the thick hot chocolate. By the end, I was questioning whether or not I should have stopped two churros ago. We should probably feel guilty for finishing the entire plate, but it was a “cultural” experience, right? I’m glad I can check this authentic food experience off of my foodie bucket list. Anyone ever attempted churros at home? Last time I made them was in culinary school and they were divine. Next time I have a craving my plan is to try Bar Jamon‘s version which I’ve heard does a pretty good job of duplicating the traditionally thick hot chocolate and churros dusted with cinnamon and sugar. Heading to Spain next week. Mind sharing exactly where those churros came from. They look divine. stanton and i bought a churro maker when we went to spain. quite possibly the best souvenir ever. you've gotta give me the dirty on spain. if i could eat churros y chocolate every morning for breakfast, matt may not have as hard of a sell as he thought he had. I just saw your commercial for your new show! Congratulations! I am so happy that you have made it all that way! 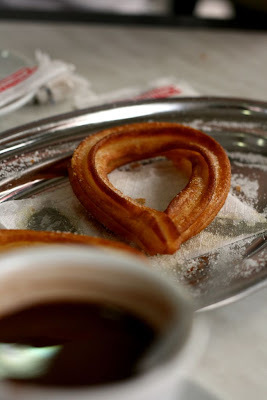 I love churros! I feel hungry upon seeing those pics.